Over the years, I have been forced to quiz many an athlete by asking,”Are you training, or exercising?” “What’s the difference?” They ask. Quite frankly, pretty stark, although the lines between true training and an addiction to exercise can easily become blurred. Let’s take a look at some of the characteristics of each, and how to help tell the difference. Exercise is pretty simple, and the most basic building block of what we do. It is swimming, biking, running, yoga, strength work, rowing, basketball, etc. You get it. Exercise exists for its own purpose, and to satisfy our current selves, or to make some kind of a change to our future selves through weight loss, increased energy levels or just feeling better about ourselves. Training is also pretty simple. For the most part, it is a way of life. Training takes exercise, diet, sleep, recovery, hydration, mental fitness (and many other things) and combines them into a plan. A program. Much of training involves exercise, but not all of it. The end goal of training is to perform at a set event, or during a specific time period. And, sometimes, training involves no exercise at all. This rest serves the purpose of increasing your ability to exercise more, and/or more intensely. Training is about satisfying our future self, with the achievement of a set goal, whatever it may be. Training takes exercise and puts it to good use. Exercise is a component—a tool—of training. But, exercise can very quickly (and easily) start to serve its own purpose. And, when does it go too far? Exercise, for the sake of training, is, typically a good thing. Exercise, for the sake of exercise, is, typically, a good thing. But, when exercise feeds a need for exercise, or serves to quell body image issues, it can become a counteractive tool; for the athlete trying to achieve a performance goal; for the exerciser, trying to feel better about themselves; and even for the individual battling with body image issues or disordered eating. So, in your own sphere, are you training or exercising? Here is a quick check! The enhancement of restorative techniques, to increase the capacity for added stress. Specific focus on good quality sleep, as well as maintaining good quality nutrition. Maximizing the amount of “good” stress applied –> exercise!!! Minimize the amount of “negative” stressors –> work, poor nutrition, drugs, alcohol, etc. Realizing and accounting for mental fitness limitations. Sometimes NOT working out, in favor of rest. If your approach is focused on the points, above, then you are probably training! Regardless of the type, all athletes (and people for that matter) have a total stress budget available to them. Proper training techniques allow us to maximize the amount of “good” stress that we apply to that budget, and minimize the negative stressors that we expend. Good restorative techniques allow us to expand this budget, and hopefully the amount of “good” stress that we can absorb. As this budget increases, so do our performances. Negative exercise patterns can often be identified by our answers to the following questions. No single “yes” answer is definitive, but the more that you realize, the more you should consider whether, or not, you are battling an exercise addiction, and possibly work with a psychologist, registered dietitian, and/or coach. Do you feel as though a workout isn’t successful unless you finish it feeling extremely spent? Do you find yourself being very restrictive with your dietary intake, even when others (coaches and RDs) say that you shouldn’t be? Do you struggle with injuries, including stress fractures? If female, have you not had a menstrual cycle in the past 90 days? Do you try to stay lean year-round, even when not in the midst of the competitive season? Do you ever experience periods of extreme fatigue, and/or low levels of motivation? While many, many, many exercisers do so for the endorphin highs that they receive from activity, generally speaking, the primary cause of exercise addiction is a connection to disordered eating. The inner misnomer that thinner is always better. Well, it just ain’t so! It doesn’t take very long before an exercise addiction can lead to a performance-based type of acute triad that can plague athletes, male or female, beginner or professional. Informally, I refer to it as the Endurance Athlete Triad, and while it is a greater issue for the longer distance athlete, it can undermine potentially great performances at all race distances. Over-dieting, most often through being too stringent on caloric intakes. Athletes with this condition often show up on race day with a mental atmosphere lacking any sense of confidence, and a body that is over-tired, and both, mal- and under-nourished. It, typically, results in a disappointing finish, which highlights a further lack of confidence, pushing the athlete into a downward spiral of negativity. Among athletes with Type A personalities, the usual response is to work harder and place even more dietary restrictions on oneself. This is a certain recipe for disaster! In females, chronic occurrence of the Endurance Athlete Triad can certainly lead to the well-known Female Athlete Triad, as the root causes follow similar psychological patterns. Over the long-term, the results of any kind of exercise addiction can be very, very stressful upon the body. As a result, the body is under constant negative stress, which leads to increased cortisol levels, and a catabolic state. Any positive effects of exercise are soon lost, and only compile upon an already negative situation. So, when I ask the question, “Are you training, or exercising?” If you are looking for performance results, the answer is important. “What’s the difference?” Well, that is pretty important, too. Tim Snow is a Professional Triathlon Coach with QT2 Systems and the Operations Director for QT2 Systems, LLC. Tim raced at the professional level from 2000 to 2015, including 27 Ironman finishes. 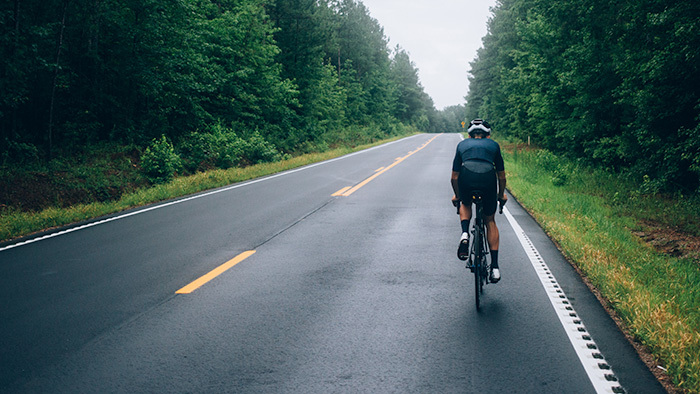 He coaches top-level triathletes, through QT2's 1-1 Coaching service, and manages the day-to-day operations of the QT2 Systems Brand of Endurance preparation businesses. These brands include QT2 Systems, OutRival Racing, The Core Diet, The Run Formula, and The Cycling Formula.